I didn't take this picture- I have no sweet potatoes right now because I am emptying my fridge in preparation for travel! But here is my favourite thing ever because it is healthy and delicious! 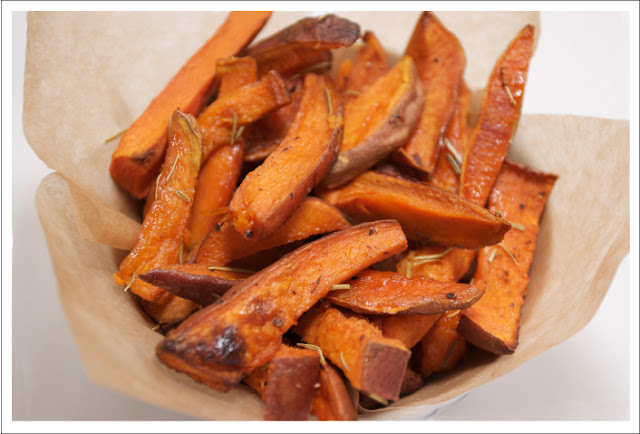 To make these yummy fries, preheat oven to 400F and cut up a sweet potato into fries. Mine are similar in size to the photo above, for reference. I like em chunky. Next, spray a baking sheet with cooking spray. Line up your fries on the sheet and spray the tops again with the cooking spray. Season with salt and pepper. Cook in oven for about 17 minutes (check often to make sure they don't burn. Oven type and fry size can vary). No need to flip over! Just put onto a plate and chew down! Mm... I love sweet potato fries.